Last weekend, I was talking to friends about an old NY Times blog post I had read regarding how much the average family wastes on spoiled food each year. This was especially relatable to me because when we bought our house and packed up our food, I had to trash bags of groceries because so many things had expired. We’re also notoriously bad for not eating leftovers and considering that we are only 2 people, there are generally A LOT of leftovers to be had. On top of it all, my kitchen is never lacking; on the contrary, when I return home from the supermarket, I usually run out of space for all of my groceries. More than a few times I have come home with a can of tuna and realized that I already had four or went to use that box of instant pudding that I bought during the 10 for $10 sale only to see that it expired over a month earlier. Our friends just had a baby so they are passionate about saving money wherever they can and they shared a brilliant idea with me which I will call “Waste Not, Want Not” – when the pantry is overflowing, eat only what’s in there. Since Christmas is a week away, I decided that this would be the ideal time to start recouping the money we’ve spent over the past few months. The game plan is simple: 1. Rummage through your kitchen to see what you have, 2. No shopping unless it’s absolutely necessary (this step requires discipline), and 3. Be creative with what you have on hand. 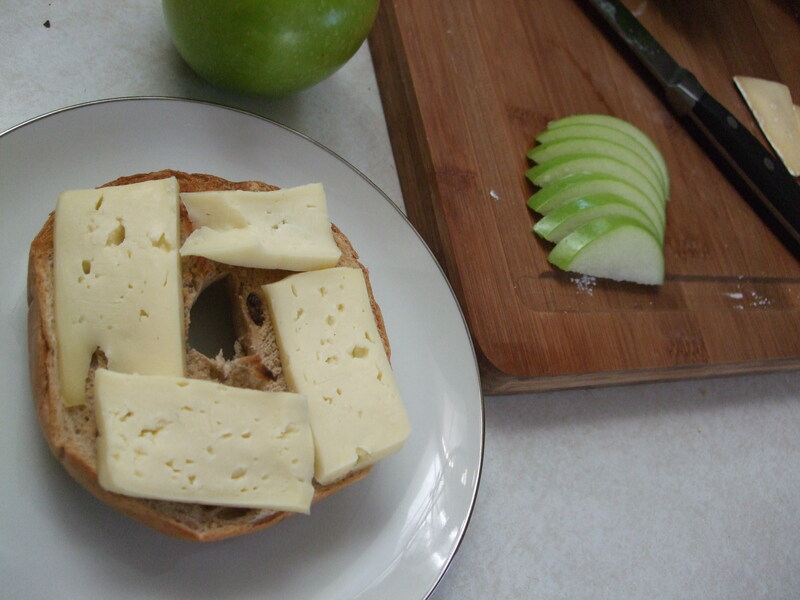 Breakfast – Open-faced Brie Bagel with Tart Apples – Used: a frozen cinnamon-raisin bagel, leftover brie from Saturday-night appetizers, and a granny-smith apple. It was super easy — toasted the bagel, sliced the brie and put it on top of the warm bagel and sliced the apple to go along with the meal. It was a delicious alternative to a bagel and cream cheese. It’s too bad that I didn’t think to broil the whole thing to get the brie bubbly and delicious until after I was done eating… It’s always the way. Dinner – Angel Hair & Chicken Parm – Used: angel hair nests, some bagged shredded mozzarella cheese that’s been in the fridge for a week or two, frozen leftover tomato sauce, leftover chopped chicken breast. 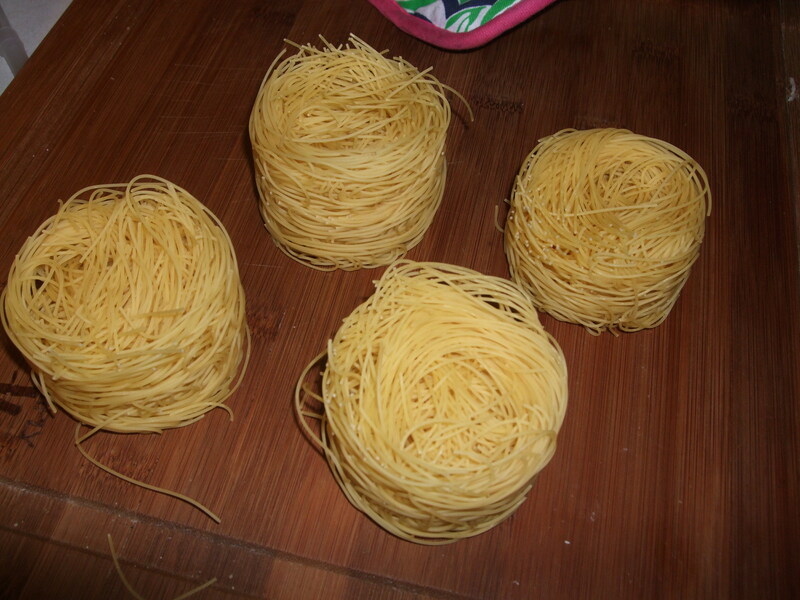 I bought these angel hair nests a few weeks ago and since Joe hates pasta (GRRRRRRRRRRRRRRRR because I LOVE pasta) I have held off on making them. I thought if I can smother it in cheese and chicken, he’d eat it. I was wrong… 😦 Well, I thought it was good so maybe that’s all that matters, plus I got 3 things out of the fridge/freezer in this meal. SCORE!